Now I get these statistics: 5,000 impressions 100 clicks and 5 sales. these are averages and not exact figures. How do I change my payment method to AlertPay? When I signed up it only asked for PayPal ID. and amazon the best its totally free? Can anyone tell me how I can change my payment method? I want to change it to AlertPay, but when I signed up it only had an option for PayPal. they are suspend my account without an explanation! 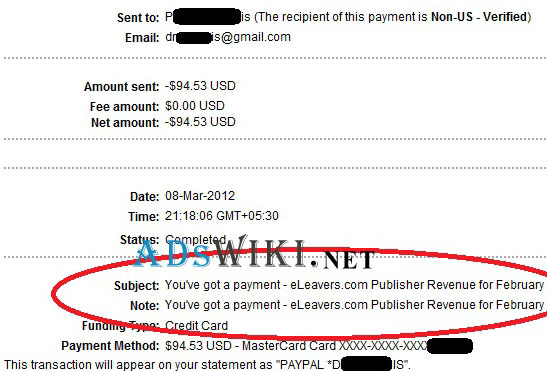 if you want to make money , do not use ELEAVERS , never! i am waiting for their payout.. i will remove the code.. Because they give very bad revenue! for example today i have 403 Clicks and 1,67 $ revenue! Today i maybe find the best adsense alternative. I have been looking into using Eleavers.com for a while but wanted to see some proof that it was a good service. thanks for your review,i’ll try it. Here is how to make money online.